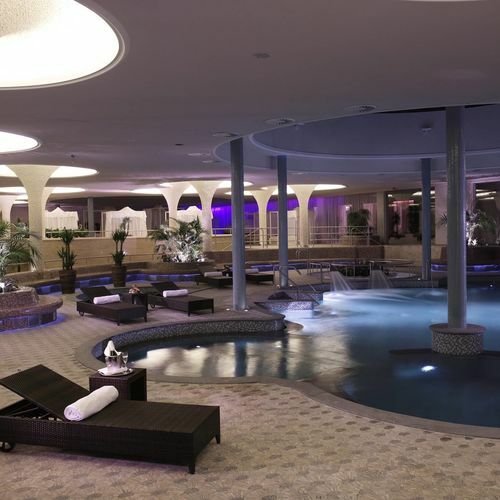 The Spirit Hotel Thermal Spa***** in Sárvár, the latest five-star-hotel of Hungary opened its doors in Spring 2008. It lies close to the “seven lakes” of Sárvár and is surrounded by beautiful forests. The centre of town is within a 15-minute walking distance. The Spirit Hotel is one of the unique hotels in Europe and was awarded as the Best Spa Hotel of Hungary. Particular forms, wonderful rooms and novelties in construction are in balance with the nature around. The hotel awaits guests with 273 individually and elegantly furnished hotel rooms and suites, equipped either with balcony or terrace, in absolutely peaceful surroundings. 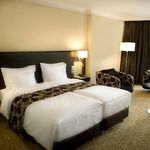 As extra services, guests can choose from orientel-style round beds, fantasy corners or whirlpools in certain room types. All these fit to the demands of the five star level. 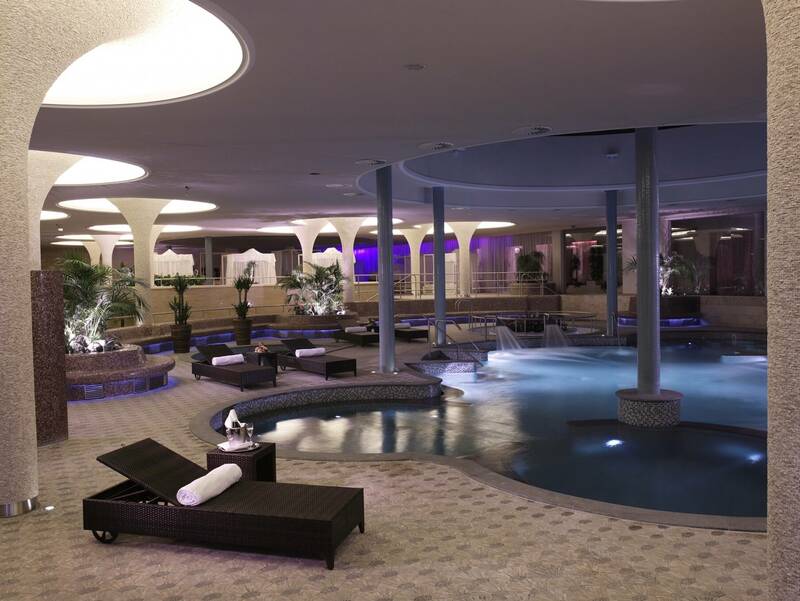 The luxurious spa area of 10 000 m², with 22 pools and a large therapy and medical spa centre is unique in Europe. The medical services are based on the world-famous mineral hot springs of Sárvár. The hotel has its own mineral hot spring: a 250 million year old source from a depth of 1,056 metres. All mineral hot spring pools are filled with our own Spirit Mineral Hot Spring Water and they are 100% free of chemical substances. The water in the mineral hot spring pools are changed on daily basis. The hotel also offers a well equipped fitness-room, bowling, squash and two tennis courts. In the surroundings you can enjoy Nordic walking, cycling, horse-riding, etc. With its own mineral hot spring and the seven lakes around in the beautiful and peaceful surroundings, Spirit Hotel offers a romantic ambience and a perfect getaway from everyday stress. The rating of Spirit Hotel Thermal Spa Sárvár is 9.6 from the maximum 10, 236 based on actual and valid guest ratings and reviews. "Programszervezés! 2018 12 28 Ugróköteles bemutató.A 2 fiatal igen nívós produkciót mutatott be.A kijelölt hely erre nem volt alkalmas./a bemutató alatt a kötél folyam atosan ütközött a menyezettel,?/Akiknek a Cirque du soleil fantasztikus társulatával élő szerződésük van méltóbb törődést érdemeltek volna! A műsor elején egy BEMUTATÁS, a végén egy KÖSZÖNJÜK a produkciót,nagyon hiányzott." "Nagyon pozitív tapasztalataink voltak minden területen.Szoba,szolgáltatások a wellness,az ellátás területén.A konyhájuk kitűnő - őrizzék meg a szakácsokat! -és bőséges.A személyzet udvarias, fölkészült kedves.A recepción az ügyintézés gyors a személyzet felkészült udvarias. Köszönjük!" "Tisztasag kényelem Nagyom jó közérzrt"
Based on the reviews and comments of actual guests, the services of the Spirit Hotel Thermal Spa Sárvár have received a high rating of 9.7/10.